At recent NADA expo, Bosch engineer Eric Wuchte sets up fixture to calibrate ADAS systems on Toyota Camry. SAN FRANCISCO – Driver-assistance systems such as radar-based cruise control and camera-based automatic emergency braking are proliferating on new vehicles today and can make them safer and more enjoyable. But replacing a cracked windshield or raising, lowering or realigning the suspension could render those systems inoperable unless they are properly calibrated at the dealership or service garage. “If you’re in an accident and have body repairs done, the system needs to be calibrated,” says Eric Wuchte, product manager of Bosch Automotive Service Solutions. At the recent National Automobile Dealers Assn.’s annual convention and expo here, Bosch displayed the latest generation of its ADAS calibration fixture, which can be set up in front of the vehicle and communicate with its onboard diagnostic port to make sure the radar and camera sensors are functioning properly. Last summer, an aftermarket glass shop replaced a windshield in Newfoundland, Canada, but did not calibrate the forward-facing collision-avoidance camera. The ’16 Acura MDX attempted to steer into oncoming traffic, but the alert driver took control of the vehicle and overrode the system. The glass shop, along with others owned by Belron, including Safelite AutoGlass, now uses proper calibration equipment after replacing windshields. With about 700 U.S. stores, Belron is Bosch’s biggest customer for the calibration systems, but the supplier is negotiating with automakers to validate the tool for use in dealerships as well, Wuchte says. “We want to be the fastest to set up and the easiest to use,” he says. Growth in driver-assistance systems has been brisk, illustrating the importance of calibration after vehicle repairs are made. 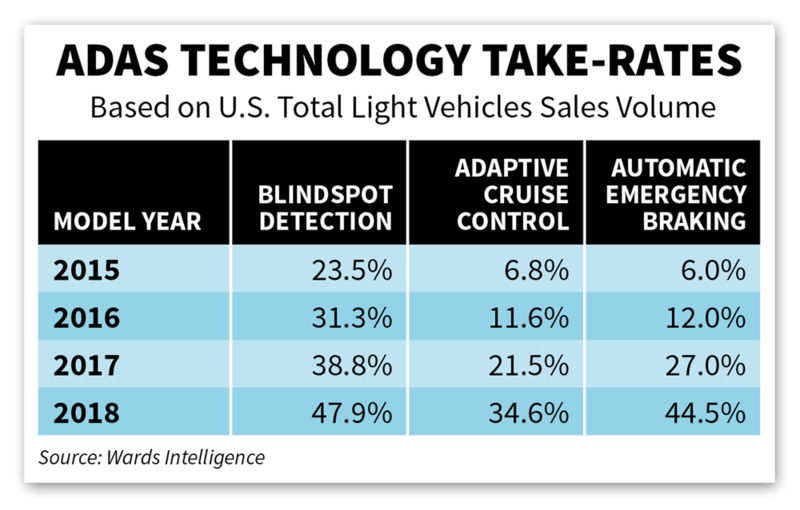 Wards Intelligence data shows nearly half all new vehicles sold in the U.S. last year were equipped with blindspot detection and automatic emergency braking. 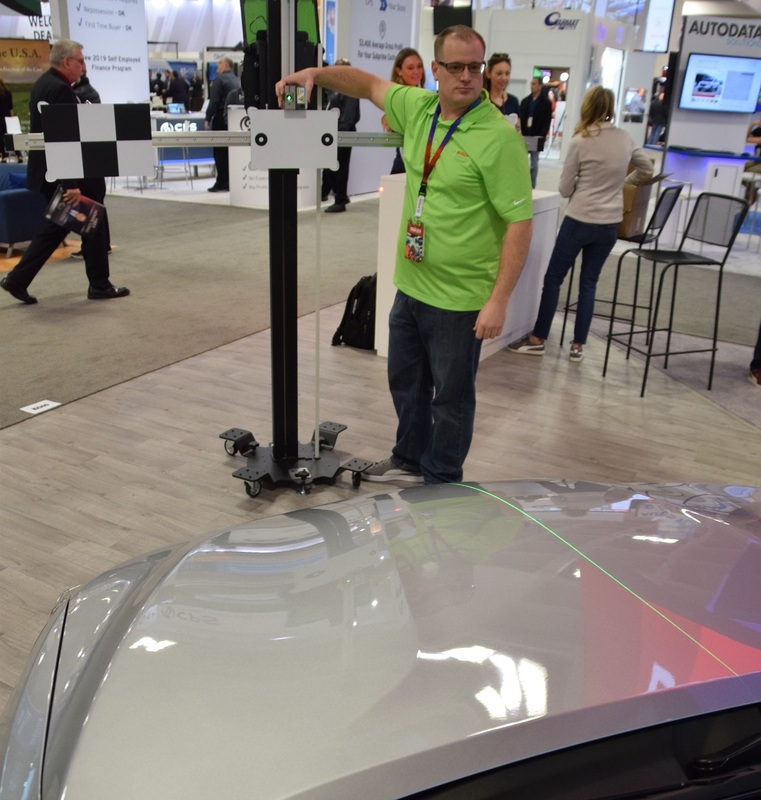 The Bosch system has been in the market for two years, and the latest version shown here uses a high-definition camera facing the vehicle and overlaying a virtual line to ensure the calibration fixture is precisely perpendicular to the vehicle. The camera-based positioning system should be available by year’s end, Wuchte says. In the meantime, technicians can use a green line laser, conventional tape measure or standard tape measure to properly position the calibration fixture. High-end vehicles available on the market today use up to six video cameras, including one or two positioned near the rear-view mirror behind the windshield. Cameras also can be placed in the front and rear and in each side-view mirror, and the images are stitched together on the display screen so the driver has 360-degree surround view when backing out of tight parking spots. Likewise, long-range and mid-range radar sensors are becoming common in today’s vehicles, enabling adaptive cruise control to keep pace with a vehicle in front. If the lead vehicle slows or stops, ACC will ensure the trailing vehicle will do the same. In addition to these forward-facing sensors, the industry is using radar in the rear corners of the vehicle for blindspot detection. In total, Wuchte says vehicles today can employ up to five radar sensors. The Bosch calibration tool works for all existing radar and camera systems, and the next technological challenge will be calibrating lidar sensors that will be necessary in autonomous vehicles. Today’s lidar systems are expensive and unsightly, perched as a dome atop the vehicle. But solid-state systems are in development that will be less expensive and smaller for easier packaging within the vehicle. “We do have solutions in our pipeline to solve that calibration need as well,” Wuchte says. The calibration fixture can be set up in about five minutes, with target boards facing the vehicle to communicate with the forward-facing sensors. Once a diagnostic tool is connected, the vehicle’s central controller can set the proper parameters for the cameras. Adjusting the vehicle’s radar sensor is similar but requires a physical adjustment by the technician based on information from the diagnostic software. Bosch’s calibration tool costs between $6,000 and $16,000, depending on how many target boards the shop needs or whether the shop needs the diagnostic tool. Wuchte says Bosch is working with automakers through bulletins to make sure dealers and other service shops are aware that calibration is required for these advanced safety systems. Aftermarket windshield shops can be problematic because of low-quality glass. “We have had situations where the camera will not calibrate, and the fix is to replace it with OEM glass,” Wuchte says. If the camera or radar systems are not properly calibrated, the vehicle should alert the driver by way of dashboard light that they are inoperable. Wuchte uses green line laser to properly position calibration fixture relative to vehicle.